Every year, the Australian Commonwealth and the State governments spend billions of dollars in grants to individuals, small business, communities, not-for-profits, universities, corporations, etc. Philanthropy organisations, nearly 5,000 in Australia, are giving approximately an extra billion dollars in grants. Behind the success of the new wave of location based mobile apps taking hold around the world is digital mapping. Location data is core to popular ride-sharing services such as Uber and Lyft, but also to companies such as Amazon or Domino’s Pizza, which are testing drones for faster deliveries. 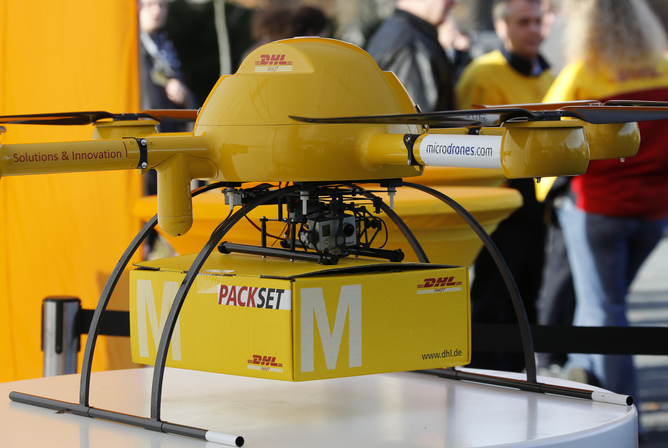 Last year, German delivery firm DHL launched its first “parcelcopter” to send medication to the island of Juist in the Northern Sea. In the humanitarian domain, drones are also being tested for disaster relief operations. Better maps can help app-led companies gain a competitive edge, but it’s hard to produce them at a global scale. A few select players have engaged in a fierce mapping competition. Google leads the race so far, but others are trying to catch up fast. Apple has enlarged its mapping team and renewed its licensing agreement with TomTom. TomTom has plans to 3D map European and North American freeways by next year. In Europe, German carmakers Audi, BMW and Mercedes agreed to buy Here, Nokia’s mapping business. The company had been coveted by Uber, which has gained mapping skills by acquiring deCarta and part of Microsoft Bing. Further signs of the fever for maps are startups such as Mapbox, Mapsense, CartoDB, Mapillary, or Mapzen. The new mapping services are cloud-based, mobile-friendly and, in most cases, community-driven. 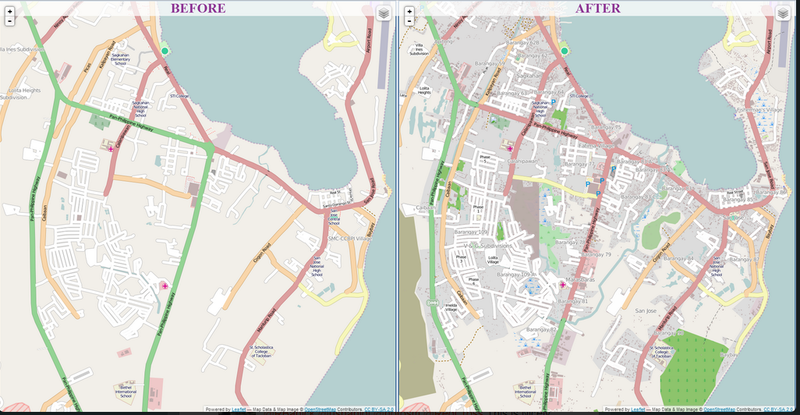 A flagship base map for the past ten years has been OpenStreetMap (OSM), also known as the “Wikipedia of mapping”. With more than two million registered users, OpenStreetMap aims to create a free map of the world. OSM volunteers have been particularly active in mapping disaster-affected areas such as Haiti, the Philippines or Nepal. A recent study reports how humanitarian response has been a driver of OSM’s evolution, “in part because open data and participatory ideals align with humanitarian work, but also because disasters are catalysts for organizational innovation”. A map for the commons? While global coverage remains uneven, companies such as Foursquare, Flickr, or Apple, among others, rely on OSM free data. The commercial uses of OSM primary data, though, do not come without ongoing debate among the community about license-related issues. Intense competition for digital maps also flags the start of the self-driving car race. Google is already testing its prototypes outside Silicon Valley and Apple has been rumoured to work on a secret car project code named Titan. Uber has partnered with Carnegie Mellon and Arizona Universities to work on vehicle safety and cheaper laser mapping systems. Tesla is also planning to make its electric cars self-driving. Are we humans ready for this brave new world? Research suggests young people in North America, Australia and much of Europe are increasingly becoming less likely to hold a driver’s license (or, if they do, to drive less). But even if a new generation of consumers were ready to jump in, challenges remain huge. Navigation systems will need to flawlessly process, in real time, position data streams of buildings, road signs, traffic lights, lane markings, or potholes. And all this seamlessly combined with ongoing sensing of traffic, pedestrians and cyclists, road works, or weather conditions. Smart mapping at its best. Legal and ethical challenges are not to be underestimated either. Most countries impose strict limits on testing self-driving cars on public roads. Similar limitations apply to the use of civilian drones. And the ethics of fully autonomous cars is still in its infancy. 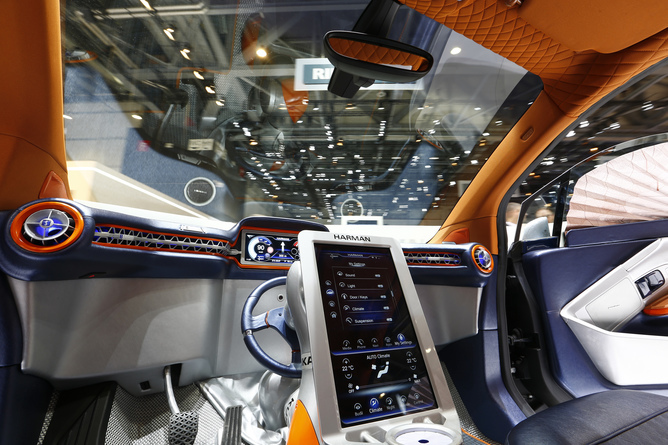 Autonomous cars probably won’t be caught texting, but they will still be confronted with tough decisions when trying to avoid potential accidents. Current research engages engineers and philosophers to work on how to assist cars when making split-second decisions that can raise ethical dilemmas. Digital mapping technology promises to unveil our routines, preferences, and consumer behaviour in an unprecedented scale. Staggering amounts of location data will populate our digital traces and identities. The impact on our lives, organisations, and businesses is yet to be fully understood, but one thing is sure: the geomobile revolution will be mapped. This is an update of the post I wrote on crowdsourced constitutional reform in 2011. Constitution-making can be broadly defined as a set of activities intended to produce a constitution, the highest law of a state. To the UN Rule of Law, constitution-making “covers both the process of drafting and substance of a new constitution, or reforms of an existing constitution”. Over the last five years, crowdsourced constitution making initiatives have been deployed in 15 countries across the world: Iceland, Kenya, Ghana, Somalia, Morocco, Tunisia, Egypt, Libya, Malawi, Zambia, Yemen, Nepal, Fiji, Ecuador, and Bolivia (see the USIP Report on “New Technologies for Constitution Making”). The Chilean government has just announced its plan to launch in September 2015 “a new, citizens-driven process to create a new constitution”. To be sure, these participatory processes are not new in constitution making. South Africa or Uganda, among other countries, launched participatory campaigns to collect public input for their new constitutions in the 1990s. So what is in between of these two decades of participatory constitution making? The rapid, unprecedented adoption of mobile technologies and social media. In the effort to make constitution making as participatory as possible, this new wave of crowdsourced initiatives have all taped on social media (and, wherever Internet connections were fragile, e-mail and text messages) to collect comments from the public. In most cases, and regardless of the final number of participants, thousands of comments were posted and eventually collected. 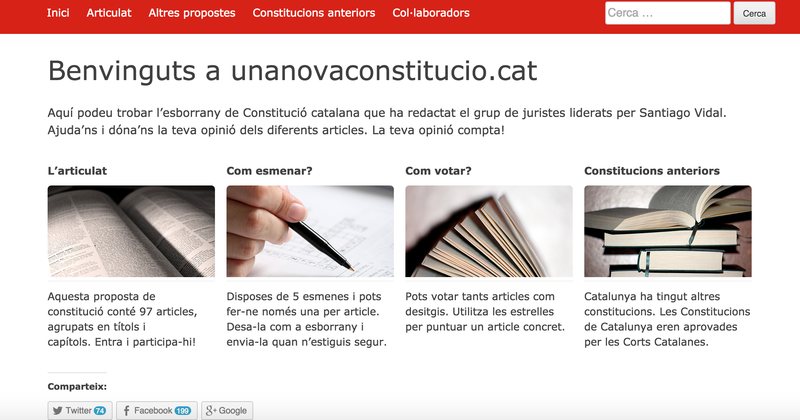 Crowdsourced constitution making allows people to comment, “like” or vote articles in a constitutional draft. The processes typically rely on online deliberation over a draft that is elaborated elsewhere, usually by a constitutional commission. But the impact of such deliberative processes on the final outcome is yet to be fully understood and requires a case-by-case analysis. An alternative to crowdsourcing the deliberation process could be microtasking the constitution itself. Microtasking is a process consisting of defining a relatively complex task and dividing it into smaller and independent micro-tasks. When it comes to constitutions, this process could be relatively straightforward since they are already divided into sections and articles. People could take these articles and amend, modify, or rewrite them at their will. In this paper we propose a task-oriented approach to crowdsource the drafting of a constitution and we consider some of the challenges that such a process would face. But further research would also require to tackle substantive issues on how to coordinate the crowd itself: (i) motivation; (ii) incentives to participate; (ii) relevance and quality of the contributions; (iii) monitoring spam and sabotage attempts, etc. The ultimate challenge is how to engage the crowds’ collective wisdom in drafting such a high-impact legal document as a national constitution. 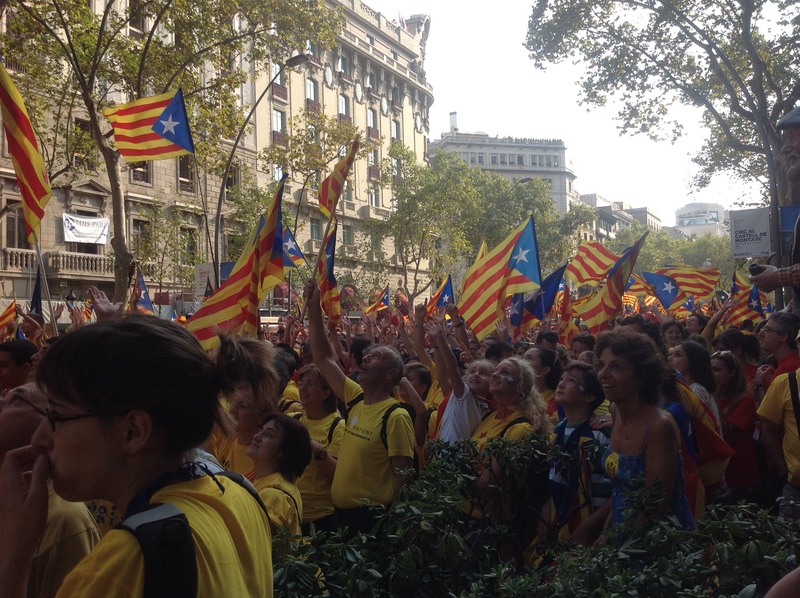 Catalonia in Europe: who will play the game? The future relationship with the EU is a core issue in today’s debate about the independence of Catalonia. 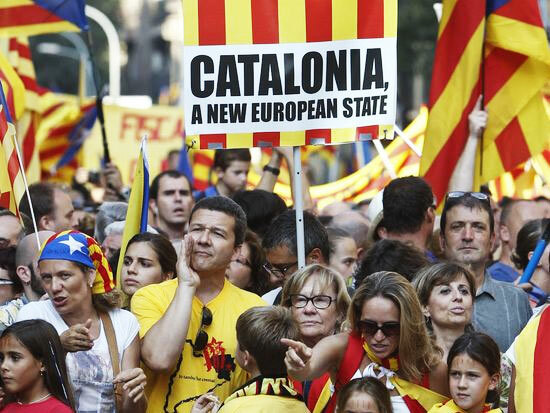 The slogan of the 2012 rally in Barcelona was “Catalonia, next state of Europe”, echoing the majoritarian desire within the independentist movement to be part of the EU. The recently released White Book on the National Transition (very much in line with Scotland’s Future published last year by the Scottish Government) contains a specific 50-pages report on the different scenarios for integration into the EU (the report considers 4 different scenarios ranging from swift accession to exclusion sine die). Both the Catalan government and the independentist movement expected that a victory of the “yes” in the Scottish referendum would had paved the way for a model of smooth accession to the EU. 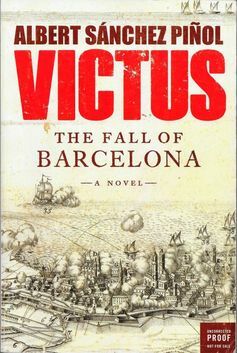 As this didn’t happen, Catalonia will need to make its own way. There is no provision in EU treaties on the secession of a territory from a member state (even if Europe has witnessed the emergence of a number of new states since 1990s). There are provisions to join (art. 49TEU) and to leave (art. 50TEU) but not “to stay” as a new state, so to speak. The flexibility and pragmatism of the EU. As Graham Avery recently put it, “the policy of the European institutions is not to have a policy” (deliciously ironic, since Avery writes as a Senior Advisor of the European Policy Center). As he goes on, the implicit policy seems to be “initial reluctance followed by pragmatic acceptance, provided that the process can be considered as constitutional”. Premise one focuses on the law, while premise two emphasizes politics. The statements by EU authorities can also reflect this oscillation. This is notably the case of former EU Commission President Mr. Barroso. In a written answer given on August 28th 2012 on behalf of the Commission, Barroso confirmed “that in the hypothetical event of a secession of a part of an EU Member State, the solution would have to be found and negotiated within the international legal order. Any other consideration related to the consequences of such event would be of a conjectural nature”. Pragmatism to its fullest. In a letter addressed to Lord Tugendhat only 3 months later (10 December 2012) he stated that “if a part of the territory of a Member State would cease to be part of that state because it were to become a new independent state, the Treaties would no longer apply to that territory. In other words, a new independent state would, by the fact of its independence, become a third country with respect to the EU and the Treaties would no longer apply on its territory”. Leges sunt servanda. So who will play the game? In Spain, that’s lawyers, for sure. There are figures no one seems to pay much attention: last year, there were more than 42,000 registered lawyers in Madrid and more than 23,000 in Catalonia. With more than 147,000 lawyers registered in Bar associations, Spain ranks number two in Europe when it comes to lawyers per 100,000 inhabitants (only second to Luxembourg, which hosts the European Court of Justice and a large banking system). The figures do not include law graduates and legal professionals not paying fees to the Bar. 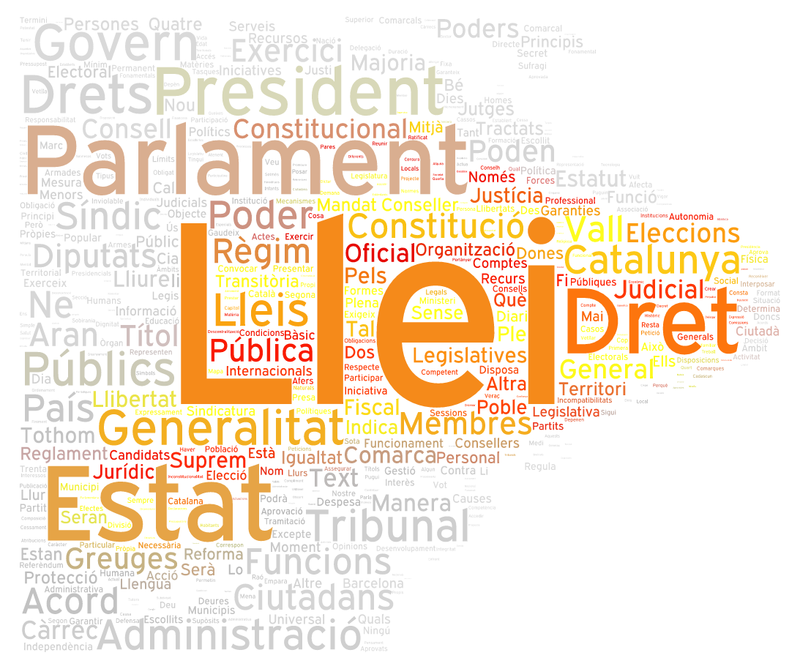 Most popular questions these days on the public debate on Catalan independence: Is this move constitutional or unconstitutional? 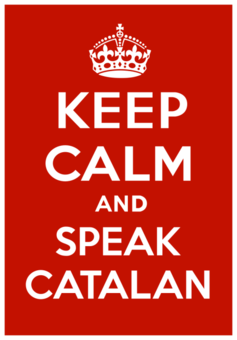 Should the [Spanish/Catalan] government appeal? On what grounds? And what do EU Treaties say? The debate has been hijacked by endless legal arguments, and a large army of lawyers make their legal points in cabinets, in parliament, in courts, and in the media. Law has engulfed politics. Leges prevail over pacts. Dear lawyers, fair enough. But… knock knock Europe… anyone else in the house? Big data from social media is increasingly used in disaster management procedures. The speed at which big social data feeds travel across the networks has already been leveraged at the early warning stage by agencies such as the United States Geological Survey, which is currently developing a system to detect earthquakes by monitoring Twitter real-time information from local users. In Australia, the CSIRO is also testing emergency situation awareness (ESA) software to sense unusual events in the Twitter stream and alert users in the emergency services. The potential of processing social media data in the phases of early warning and immediate response is huge. Big data can contribute to provide the big picture, while offering at the same time granular, real-time information at the local level. However, processing such an amount of information can largely exceed the capacities of most agencies and response organizations, especially in the immediate aftermath of a disaster. The Typhoon Haiyan that is currently hitting the Philippines is the most updated example of how relief organizations can leverage the resources of the crowds to scan social media, tag tweets and images, geolocate events, translate keywords for monitoring, etc. The UN Office for the Coordination of Humanitarian Affairs (UNOCHA) has requested the activation of the Digital Humanitarian Network, which coordinates volunteer organizations around the world (SBTF, OpenStreetMap, GISCorps, Humanity Road, Info4Disasters, Translators without Borders, Statistics Without Borders, Disaster Tech Lab, etc.) to participate in the effort. At this present moment digital volunteers from these organizations are working around the clock in a number of different tasks (see this post to learn who is doing what) and using new applications specifically developed for disaster response purposes. Two of these apps, the TweetClicker and the ImageClicker (recently developed by Patrick Meier’s team at the Social Innovation at the Qatar Foundation’s Computing Research Institute) allow any member of the crowd to tag tweets and images with just a click. While still in a testing phase, these technologies are opening up a new frontier in the use of big data for disaster response.